Just finished proof-reading Enter Title Here and sent it off to my agent. There’s a decent chance that he’ll request more edits, but I feel confident in saying that at this moment, in my mind, the novel is done. If I wasn’t currently represented, this is the point at which I’d begin writing my query letter and synopsis and assembling a list of agents that I’m interested in. You obviously have no reason to trust me when I say this, but this novel is extremely good. 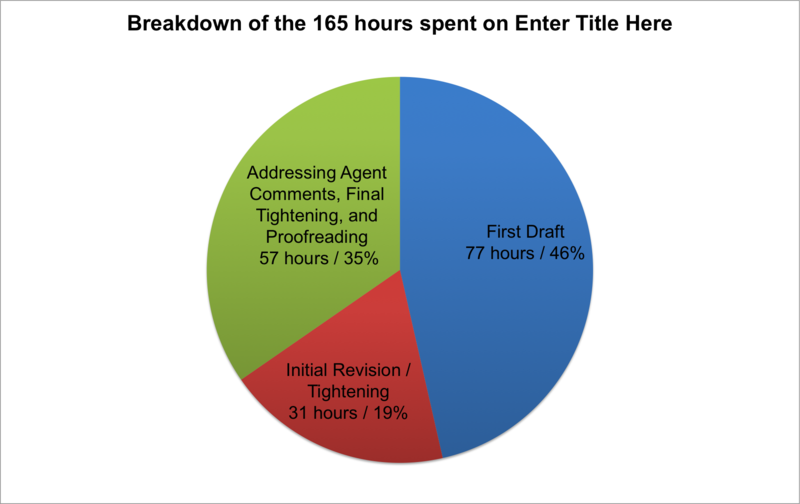 Given that, I thought it might be interesting if I broke down exactly how much time I spent writing this novel. This analysis is possible because for the past eighteen months I’ve been keeping notes on two things: a) how much time I spend writing each day; and b) what I spend each day working on. Since I started ETH a little bit more than a year ago, this is the first time that I have a complete start-to-finish record of all the time I’ve spent working on a book. I got the idea for ETH on July 17, 2012, but I didn’t work on it for another 5 months (though I did spend a fair amount of time visualizing it). I began drafting it on December 18, 2012 and finished the first draft on January 18, 2012 (hey, exactly one month!). The second phase of revision took place over 5 days in May and 4 days in September. This involved cleaning up the novel, tinkering with some of the characters, eliminating inconsistencies, and cutting about 10,000 words. I sent it to my agent in September and got back comments about a month later. The third phase of revision began on December 7th and ended yesterday. During this phase, I made four passes through the novel. First, I went through from top to bottom, looking at every chapter, scene, and paragraph, asked myself, “Does this belong here?” During this pass, I cut about 16,000 words. Then I made a second pass where I addressed the specific comments made by my agent. Then I made a third pass where I went through and tightened all the sentences. This resulted in cutting about 7,000 words. And, finally, I went through the novel backwards and had the mac’s text-to-speech software read out every word so I could catch any typos or dropped words. During this phase, I also did a final check for internal inconsistencies and stuff that I needed to google in order to make sure it was true*. And then I emailed it off. In total, it took 165 hours of work over 60 days. I’m not saying that this is the best way to do it or even that I will necessary do all my other novels like this. In fact, perhaps this is simply a horrendous way to do it and I am leading you all stray. But this is certainly one possible way to produce a relatively good-looking finished novel. 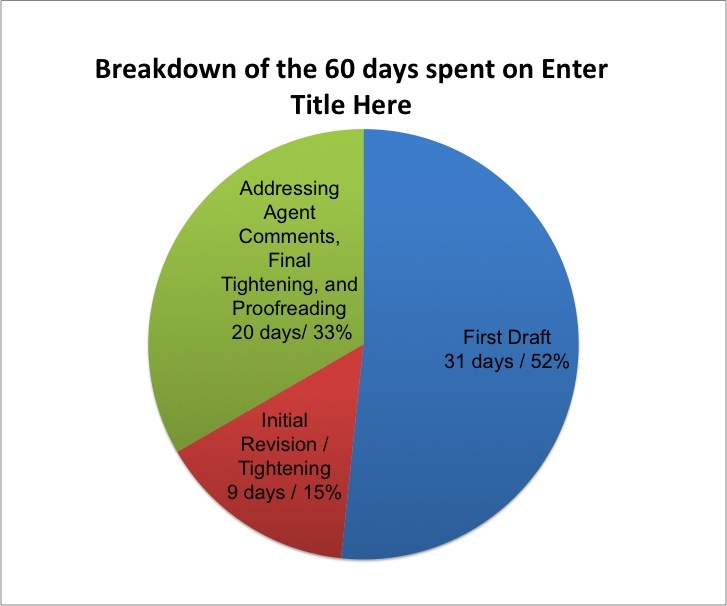 Now, everyone knows that you can write a novel in a month, but there’s always the implication that if you write a novel in that short of a period of time then you’re going to need to spend months, or even years, on revision. The major thing I’d like you to take away from this post is that there’s no reason why revision has to take such a loooooooong period of time. In this case, my writing time was about 50% drafting and 50% revision. *During this phase, I finally gave up on finding a real town in Silicon Valley that had the same features as the town in my story and just gave a fake name to the town. Yo ho ho. The last writing day of the year.